I created and uploaded a "test" form using JotForm. It does not work because the file "submit.php" is missing. How do I obtain this file for inclusion on my Web site? I checked your form and was able to submit fine. I wasn't able to replicate the issue. You could also try embedding the form using 'iFrame' or any other method. Simply go to Setup & Embed > Embed Form . returned to my specified email address. I have specified adita2@shaw.ca as the recipient address to receive the form. "cyberspace" somewhere, but it certainly is not coming to me at adita2@shaw.ca. What is this problem. This should be very simple. But it doesn't work. completed form to come to me at adita2@shaw.ca. Unfortunately, it's still not working with your suggestions. The SPAM folder issue is irrelevant in my situation. I implement a "test" within your interface. Outside of JotForm, I never receive anything. site, however, they never come to my InBox at adita2@shaw.ca. I certainly cannot figure out what is going on. Hopefully, you'll pinpoint the problem. an entirely different email account to see what would happen. I set up a brand new Gmail account. When I use this account, your form data arrives perfectly. For some strange reason, it won't work with my "shaw" accounts. jotform.ca and they told me that they do NOT filter this. So I'm still at a total loss why nothing comes through shaw. I had actually thought of suggesting that you do just what you did. Anyway, I'm glad the workaround worked. I set up automatic forwarding from my Gmail account as you suggested. However, none of my Jotform data is sent via the forwarding process. Gmail server and do NOT get forwarded. that server. It does NOT get forwarded to adita2@shaw.ca. NetNation) that do NOT forward my Jotform data, but do forward everything else. believe it. But that is what's happening, and I cannot explain it. That's weird as it should work. For the meantime, try to use a different email address except for @shaw.ca ones. I will be forwarding the case to our Developers to see if there is something we can do about this. The same result occurred. He did NOT receive the form that was submitted. Thanks for that information. There seems to be something weird going on with @shaw.ca email address. I've escalated the case to our Dev to check and we will get back to you on this. they indeed are automatically classifying jotform emails as SPAM. being allowed to go through. appeal to SHAW.CA to remove jotform from the filtering process. Please lets know if you need further assistance on this issue and we will try to support. Thank you so much Myron for letting us know about this. 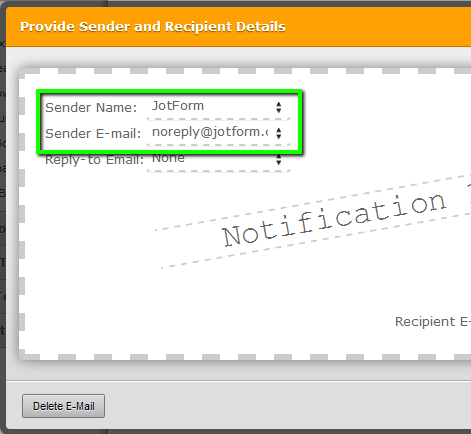 Yes, please override the current shaw setting in your computer by whitelisting noreply@jotform.com for the meantime.